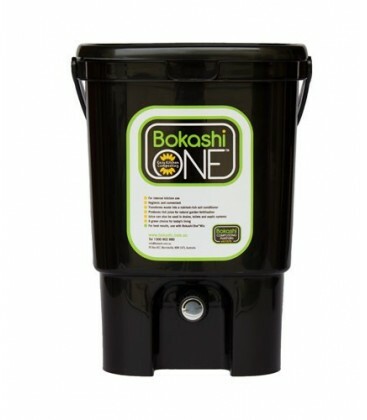 The Bokashi One Bucket measures 410mm high, 310mm wide, 300mm deep and is 20 litres in volume. It comes with an airtight lid to provide the ideal conditions for fermentation and has a grate inside which separates the solid Bokashi waste from the Bokashi juice, the tap allows for easy drainage of the juice. 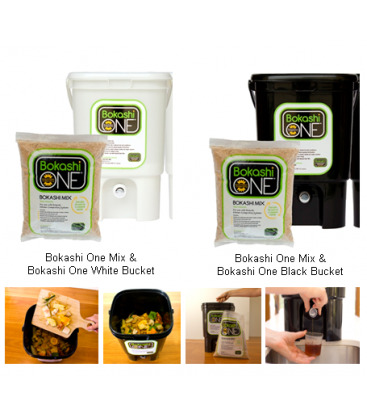 The Bokashi One is a composting system designed to be used in the kitchen. It's a practical, hygienic and convenient process which utilises food waste to produce a rich juice and nourishing compost which inject life and vitality into your garden. Food waste is layered with Bokashi One Mix in a Bokashi One Bucket. Due to the air-tight bucket and the micro-organisms present in the Bokashi One Mix, the waste ferments. The waste does not decompose in the bucket, however, it reduces in volume as its water content drains through the grate at the bottom of the bucket, creating fantastic bokashi juice. The juice is bursting with micro-organisms and can be diluted and used in the garden and around the home. When the bucket is full, waste is transferred outside and buried beneath the soil to complete the composting process. Breakdown is rapid thanks to the micro-organisms present in the Bokashi One Mix. The bins have a 20L capacity each and are made from 70% post-consumer recycled plastic. 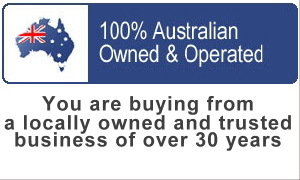 Bokashi One Mix is made in Australia. *** Single Bin: Black or White (does not include Bokashi One Mix - available separately). *** Starter Kit: Black or White: includes: 2 Bokashi One Buckets and 2 bags of Bokashi Mix. *** Bokashi Mix: 1kg bag.